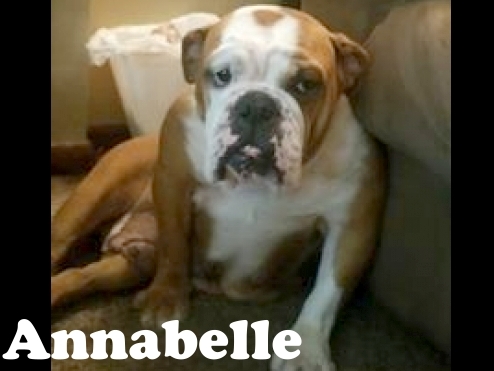 Annabelle is one of three girls from a puppy mill in Southern Missouri. Annabelle is one of three girls from a puppy mill in Southern Missouri. The puppy miller decided it was too difficult to raise Bulldogs and had changed to another breed...the Bulldogs had to go and if they had to be outside in 100 degree weather, oh well. Annabelle is very sweet, is good in the crate, gets along with everyone; other dogs, cats, children, etc. She is also very stubborn, She is doing much better now and she will let you know when she needs to go out. She doesn't know much, but is adjusting well. She does need to be watched until she is totally reliable on the house training, but she is learning quickly. She is a funny girl and is easy to bathe, groom and handle. She likes to be petted and is learning to walk on the lead and what the house routine is all about. Since she can bolt if frightened, a fenced yard would be a major positive. She is UTD on vaccinations, HW negative, microchipped and spayed. We think she will do best with another dog. Please have an application on file before contacting us about Annabelle. We only adopt within an hour radius of St. Louis MO. Adoption fee, references and vet reference and home check are required. Annabelle thanks you for your interest!